As I was going through my stuff, I found a list of rule for buying stocks. I assume I wrote them while watching Jim Cramer. Do not own too many low-priced stocks. I have bought with market orders. I plan on owning stocks/ETFs for a long time, so I don’t think that paying a bit more is that big of a deal. Plus, many times when I put in limit orders, they sit unfilled for weeks, so I just bite the bullet and buy. So far it has worked out. Big Jim knows the way to succeed in the stock market is to have a plan. First vision of Hildegard von Bingen (1098-1179), assumed allowed under Fair Use. A little over two years ago I commented on an article recommending people buy Frontier Communications because it had a high dividend yield of 9.6%. I explained that choosing a stock simply because it has a high yield is a bad idea. I wrote that “dividend growth investing” (or DGI) is a subset of “dividend investing”, and why it was better than simply chasing yield. I also outlined the general criteria that DGI investors use to select stocks. Even though I put most of my money into dividend ETFs, I still think DGI is the way to go and is a good method for selecting stocks. I think that what has happened to Frontier Communications over the past two years shows that. The October 17, 2017 announcement was for both common and preferred stock. Most people (and institutional investors) buy more common stock than preferred stock. The article I was responding to in 2016 did not mention preferred stock, so I assume they were talking about common stock. They started paying dividends in 1972 to 1998, with a few cuts along the way. Then, a telecommunications company stopped paying dividends during the dot-com boom. They resumed in 2004. There were a few dividend raises, but not enough to meet even a DGI threshold of 5 years, which is the lowest I have seen from any DGI investor. But there were more freezes and cuts than raises. They also had a reverse split in 2017, which is never a good sign. If you look waaaaaay at the bottom, there is a row for 2018 that says “Dividend omitted.” I admit, I did not see the row for 2018 at first. Probably because they put it at the bottom out of order. If you were hoping to get bailed out by capital gains (never a good idea), you were disappointed there too. On February 1, 2016, the stock was around $70. It peaked at $84 in April, 2016. It hit $70 in August, 2016, and just kept dropping. Now it is at about $7.69. Granted, I always say that price alone is not important, but a drop from $84 to $7 is bad. But I think the DGI criteria are a good signal of the health of a company. A lot of people invest based on price, and they think that a fall in price is a problem. The reality is that a fall in price is the result of underlying problems. So in 2018, they made $20 million, after spending two years losing $2.2 billion. Good times. A lot of indexers might look at this company and point to it as an example of why dividend investing is a bad idea. People need to realize that DGI investors do not simply chase yield. DGI investors look at the cash flow, the payout ratio and the dividend history. Using the DGI criteria is not a guarantee, but it increases the odds of success. You cannot just point to an individual stock and say to someone, “If you put money in that stock, you would have lost all of it! Therefore, your style does not work!” That objection assumes that a DGI investor would have put money into a bad stock, like Frontier Communications. I think for Frontier, using DGI criteria would have saved an investor from disaster. Big Jim likes sustainable cash flow. “DGI” can refer to “dividend growth investing” or “dividend growth investor”, and yes, sometimes I write “DGI investor”, which could be redundant. Image from Memgenerator, assumed allowed under Fair Use. 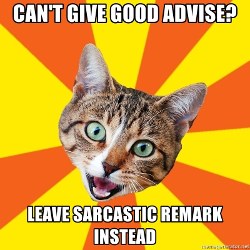 I have no idea if the misspelling of “advice” is intentional. There are many ways to invest in the stock market. There are a few I will not discuss here, such as options and other derivatives. I don’t have time to try to understand them, and I honestly think that a lot of the people that deal with these instruments on a daily basis do not understand them too well themselves. I will discuss two ways in this piece. The first is investing for capital gains. This is done by trying to buy at a relatively low price and hoping to sell later at a higher price. The other is investing for cash flow. This is what I do by investing in stocks that increase their dividends every year. Even when I was growing up, I would hear people say that the way to make money in the stock market is to buy low and sell high. The capital gains model is drilled into people, and most people never become aware of any alternative. I did not until stocks started going down in 2008. It was not until later that I learned that reinvesting dividends are responsible for at least half of the gains in the stock market in the 20th century. Until about the 1980s, investing for dividends was more common. It is a self-reinforcing cycle. Almost every financial site has charts for stock prices. Technical analysis is mostly about looking at charts of the stock price. But there are far fewer charts for dividends. During the dot-com boom, prices were rising at an accelerating rate. Why invest for a 3% yield when your stock doubles every year? Because eventually it will stop doubling every year. We saw this again in 2008: Many stocks went down in price by a lot, even stocks that paid dividends. But many of those dividend paying stocks still increased their payouts. I think that capital gains investing is no different than the Greater Fool Theory. Granted, these are not entirely mutually exclusive. I have said on this site that “price doesn’t matter”. Actually, it does not matter as much to a dividend investor as it does to a capital gains investor. If one of my stocks goes to $0, then I will get no income out of it. (But it would probably have cut its dividend before that happens.) “Price doesn’t matter as much as you think it does” is more accurate, but has a bit less punch as a catchphrase. You can only sell once. Dividend investing is like having an animal for its milk or eggs or wool. You can milk a cow, harvest a chicken’s eggs and shear a sheep multiple times throughout its life. But you can only get meat from them once. And you can only sell a share of stock once. If you are only owning something in order to sell it later, you only really get the benefit of owning it when you stop owning it. I think that is pretty strange. I don’t think pigs produce any goods while they are alive, so perhaps pigs are a better analogy to stocks that do not pay dividends. You can sell a stock that pays dividends for capital gains. That makes investing for dividends better than just investing for price appreciation. But relying solely on price can be more risky. You can only make money one way, and only at one time: when you sell. And you are assuming that you will get the price you need when you need it. Liquidity dries up when people need it the most. Captial gains investing is more like the fixed mindset, and dividend growth investing is more like the growth mindset. Selling means you are dipping into principal. Eating your seed corn. Someone once compared selling shares for profit like sawing off a tree branch while you are sitting on the wrong side of the branch. 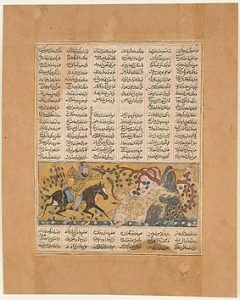 “Bahram Chubina Kills the Lion-Shaped Ape Monster”, Folio from a Shahnama (Book of Kings) by Abu’l Qasim Firdausi (935–1020), available at The Metropolitan Museum of Art, assumed allowed under Fair Use. There has been some drama in the dividend growth investing (DGI) blogosphere. The guy who ran Dividend Mantra sold it to an outside company, and for months there was little original content. The sellers said the original author (henceforth DM) would still provide content, but there was nothing. There were a lot of comments expressing discontent, and those posts were later deleted. This led to some discussion on other sites. One was Mr Money Mustache. Most people there are indexers and said DGI is not as good. Obviously, I disagree. One person said DM was stupid for only using taxable accounts and putting no money into tax-advantaged accounts. That I agree with. A few disputed the notion in DGI that selling shares is like sawiing off a tree branch while you are sitting on it. I agree with that metaphor. You can only sell shares once. But many companies pay dividends for years. It’s sort of like a cow or a chicken. You can get milk or eggs from them multiple times, but you can only eat them one time. You can only sell a share once. My goal is to never sell and to live off the dividend income. Some on the forum that the DGI investors might not reach the goal of living off dividends. That is true, but that is not a valid objection to DGI. ANY plan could fail. If that invalidates DGI, it invalidates everything. One person pointed out that while index investing can be judged by total return, DGI should be judged by the growth of the dividend income. Many on the forum disagreed, and insisted total return is the ONLY way to judge a portfolio. I disagree. While it is bad if a stock goes to 0, the point of DGI is to not rely on price alone. We saw a lot of people get hosed relying only on price in the dot com bust with stocks, and for just about every asset class in the Great Recession. Meanwhile, many DGI stocks kept paying. The funny thing about relying on price is that when you really need money, usually the price goes down. Dividends are not guaranteed, but neither are capital gains. And you might not get them when you REALLY need them. Maybe things will change in the future, but if the same thing happens for two cycles in living memory, you should pay attention. Plus, I invest in some pretty big companies. If my stocks go to 0, then whatever you are investing in is probably hosed too. I don’t think a lot of indexers understand DGI. Some of them accused DGI investors of chasing yield. As I have mentioned in the past, for many DGI investors, a high yield is actually interpreted as a sign to get out. Most prudent DGI investors also look at P/E ratio, payout ratio, and dividend history. To me, “chasing yield” is holding a stock that pays 10% for a year and then selling. Most of the stocks that DGI investors are interested in have yields from 2% to 4%, and we intend to hold for a long time. Ideally, for life. I am considering going more towards DGI ETFs. That is sort of like indexing. It’s like “indexing without the bad stuff”. But I really have no desire to buy the whole domestic market if I can avoid it. My 401K through work offers regular index funds, but no DGI funds; in this blog I mostly talk about accounts that I have full control over. As I said, I do not want to rely on capital gains. I want cash flow. Not potential cash flow. Not theoretical cash flow. Not cash flow dependent on getting a higher price. But actual cash flow. As Josh Peters wrote in The Ultimate Dividend Playbook, when a private equity firm want to take a company private, their offer price will be based on the company’s cash flow. Why not get that money now? Why wait until I sell? If the only time you benefit from owning a stock is when you sell (in other words, when you stop owning it), then it is pretty dumb to own that stock in the first place. Why should my money go into firms that are not paying dividends? As far as I am concerned, US stocks that do not pay dividends are dead weight. Granted, with foreign firms, it is a different story. There are not as many DGI ETFs for foreign stocks. Directly buying a stock listed on a foreign exchange would cause more tax headaches than it is worth. But for stocks on domestic exchanges, and as for my house, we stick with DGI. One person said indexing is better, and asked if us DGI investors thought we were smarter than the market, and advised us to listen to what the market is telling us. Well, it has shown that companies that have grown their dividends do better than the total market. S & P has a page on the Dividend Aristocrats, and it has a chart applet that you can use to compare the Dividend Aristocrats against the S & P 500. Guess what? The Dividend Aristocrats do better than the overall market. So, no, I don’t think I am smarter than the market. Unlike you, pompous indexer, I am listening to what the market is telling me. The High Yield Dividend Aristocrats also did better than the S & P 500, but not quite as much. Also, if you look at the fact sheets for those indexes, the “High Yield” Dividend Aristocrats index yields about 3%, while the regular Dividend Aristocrats index yields about 2.52%. The High Yield Dividend Aristocrats index has stocks that have increased dividends for 20 years, while the Dividend Aristocrats index has stocks that have increased dividends for 25 years. So I guess “High Yield” is relative. There was a lot of discussion about the returns of DM. Some said the only reason his portfolio gained was because he added capital to his accounts. Below is a very large table with information about some of my dividend holdings. This shows stocks for periods in which I did not buy any additional shares. I did re-invest the dividends. For each stock, there are two rows. The first is the first dividend payment I got. The second is a more recent payment. This chart was made earlier in the year, so it does not have the latest. For some, it might have a transaction from a couple of years ago. For each stock, I looked at the earliest and latest for a time period in which I only got new shares through dividend reinvesting. For the second row of each stock, the “Income Increase” is calculated by dividing the second income amount by the first. The “Div Percent Increase” is calculated by dividing the second dividend payout amount by the first. Some stocks split, so that may affect the amounts. I think the “Income Increase” is more consistently useful. So for ABM, the income from the dividends increased 34%, while the payout amount per share increased 19%. I also went from having 50.3 shares in 2010 to 56.74 five and a half years later. I would say that is a pretty good return. Image generated from an applet on S & P site, assumed allowed under Fair Use. This shows that the Dividend Aristocrats (the blue line) outperformed the S & P 500 (the green line) over the past ten years. 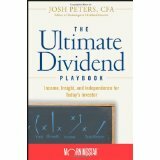 A while back I got Josh Peters’ The Ultimate Dividend Playbook: Income, Insight and Independence for Today’s Investor. It came out in 2008, and I read it just a few years ago. Here are some notes that I took on it. I am going to post them mostly verbatim. He says to focus on cash flow more than price. Cash flow is the ultimate indicator. If a private equity firm want to take a company private, their offer price will be based on the company’s cash flow (page 31). Also: During the Great Recession, many dividend paying stocks went down in price 30% but still had cash flow and still increased their dividends. Look into his dividend drill return model. This book was written in 2007 or 2008. His dividend builder portfolio has a lot of bank stocks, no oil companies, and few utilities. Granted, now in 2016, oil companies do not look like such a great bet either. He says dividends can be a signal. An article in the Motley Fool [URL not saved] points out that US firms pay consistent amounts. It may leave less to invest. True. One commenter asked why would anyone buy GM if it had a payout of 8%? Yes, a high dividend like that is a warning, and I think dividends are more likely to send a warning signal if a company pays out a consistent amount. Intersting to note: I think all DJIA stocks pay dividends. For a long time MSFT did not. Peters says chemical firms do not have a moat. The book has a section on the tax complexities of MLPs, and appendices on different industries. Personally, I plan on avoiding MLPs. Kinder Morgan bought two MLPs for which it was the general partner: Kinder Morgan Energy Partners and El Paso Pipeline Partners. I think Richard Kinder helped invent MLPs. If he thinks they are no longer a good idea, who am I to argue? Image from Amazon.com, assumed allowed under Fair Use. I saw an article on Yahoo Finance that I thought had a little bit of good advice, and some really bad advice. The title of the article is “Top 3 Dividend Stocks Offering Stability to your Portfolio in 2016”. The things the article said that I agree with is to look at dividend stocks, a reminder that the advantage of dividends is that you can get income even while the price is flat (or even declining), a reminder that dividends are not guaranteed, and to do some research on a stock before buying. The bad advice is to buy Frontier Communications Corporation (FTR) because its yield is 9.6%. A yield that high is usually a red flag, and in this case I think it is. The author looked at price-to-book and price-to-sales. But the PE ratio and payout ratio are basically 0, because they have been losing money for about a year. FTR’s long-term debt and interest expenses went up a lot in 2015. The long-term debt seemed to double, and their interest expenses went up by about a third. As far as FTR’s dividend, they started paying a dividend in 2004, and kept it constant 25 cents a share until 2010. Then they cut it to 18.8 cents a share. Then in 2010 they cut it again to 10 cents a share. Then in 2015 they raised it to 10.5 cents a share. So they are raising their dividend while they are losing money. How sustainable is that? At some point, I will write a post on my dividend investment criteria. I admit, I think I am still working it out. But I think my criteria are similar to a lot of dividend growth investors (or DGI). Under these criteria, FTR would not be looked at by many DGIs. A history of dividend increases. Some people want at least 5 years of increases. Other people want at least 10, 15, or more. The longer your time horizon, the stronger the company, but then you have fewer companies to invest in. Dividend yield. Many investors want a company to have a yield of at least 2%. Some want at least 3%. The upper limit depends on the industry. Financial firms, utilities and telecoms have higher yields than other industries, but anything above 6% is a red flag. 9.6% is a blinking red flag that just caught fire. The only criteria for selling that the DGI community agrees on is to sell if a company cuts or eliminates its dividend. Dividend freezes is a point of disagreement. Also, some DGIs sell if a stock’s P/E gets too high. So maybe FTR has a high dividend. But how long can it last if the company is losing money and is taking on debt? I plan on holding my stocks for the rest of my life and eventually living off the dividends and not selling any shares. That will probably not happen with all of the stocks I own, but there is no way I see it happening with FTR any time in the near future. The author does recommend Bank of Montreal, which looks a lot more solid. He used a proprietary screening tool to pick these stocks. FTR is such a bad pick I did not bother to look at the third. Not to brag, but when I started, all I did was spend a little time looking at the financial stocks for all of the then-Dividend Arisocrats on Yahoo Finance. I passed on a couple of stocks that wound up cutting their dividends (Diebold, and Integrys, which is now being bought by Wisconsin Energy). I think people would be better off learning how to value companies themselves and sticking to dividend growth stocks. 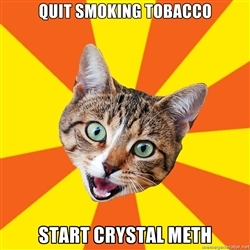 Image of Bad Advice Cat from Memgenerator, assumed allowed under Fair Use. I am thinking about shifting the investments in my taxable account from individual stocks to dividend ETFs. The original plan for this account was to buy enough shares in individual stocks such that each dividend payout would be enough to buy an entire share. I needed to have enough to get a better commission rate, and I wanted to have some diversification. That meant I could only get about a dozen stocks, and spend $5,000 or so on each. There are not many stocks that fit the criteria. There are some disadvantages to using dividend ETFs. There might be some overlap in my holdings. They only rebalance a few times a year, so they might hold a stock after it cuts its dividend. They are passive, so they will not sell a stock even though there are signs the dividend might be cut. They might also invest in stocks that I would not touch with a ten-foot pole. One of the ETFs I am looking at has shares in IBM. It’s only about 2% of the stock, but as far as I am concerned, anything more than no IBM is too much. Whenever I read an article stating that buybacks are bad (which they are) and profiling companies that make all or most of their money from financial engineering versus their nominal function, IBM is usually mentioned. It used to mean “International Business Machines”. Now it seems to mean “Incompetent Banking Manipulation”. There are disadvantages for me for making this change. It would result in a lot of churning, which is bad. The point of dividend growth investing is to buy and hold for as long as possible, preferably forever. I would have to sell the stocks I bought in my taxable account, and in some cases buy the same stocks that I sold in my IRA. There are some advantages to dividend ETFs. They can give people diversification that otherwise would be out of reach. It takes a hundred (or several hundred) shares of a stock to get a payout that will buy an entire share. But the advantage might be to reduce long-term churn. There have been a few events that have caused me to reconsider the goal of this account. Duke is buying Piedmont Natural Gas. Norfolk Southern is fending off a merger offer from Canadian Pacific, and Berkshire Hathaway’s BNSF might look into buying another rail company. Baxter split. Verizon said it’s open to the possibility of buying Yahoo (that was a real WTHBTU? announcement). And the big deal is that Dow Chemical will merge with DuPont, and then they will split into three companies. I want this account to be simpler. I will have to pay taxes on holdings in this account every year. If companies are buying and selling to each other, that will make my life more complicated. I am not a lawyer or an accountant, but I think that an ETF will shield me from some of that complexity. Image from Wikipedia, assumed allowed under Fair Use. WTHBTU: What the heck brought that up? As I had mentioned previously, I opened a taxable brokerage account to buy more stocks. The plan is to put in some money, and buy enough shares of each such that each dividend payment will be enough to buy an entire share. At first I thought I would buy shares of additional companies. Now I am thinking of replacing shares of companies in my tax-advantaged account as well. Granted, if I did that, I would lose the tax advantages for those shares. But it would free up money in my retirement accounts to buy additional shares of the companies I would still own in those accounts. It has taken three years to buy an additional share of 3M. Perhaps I could finally buy more and reduce that time. I am thinking about re-buying shares in Deere. They increased their dividend a few weeks ago by about 17%. It was one quarter late, but I think it still counts towards their streak. I know I keep saying I should stick to my rules, but I am still trying to work out what my rules are. How strict should I be? I held on to Intel after they had gone 8 quarters without a dividend raise. Deere raised theirs after five quarters. They have a nice P/E ratio, and they are still making money. Plus they are in the agriculture business. Sort of. I think along with energy that food and water will be huge issues (and huge money makers) in the next decades. I think Deere is a good way to play that. Plus they are based in Illinois. I bought Kellogg recently. I read an article that pointed out that most things we buy at the grocery store come from a handful of companies. Kellogg is on the list. I will start looking at some other companies listed in the article: Kraft, General Mills, JM Smucker, even Pepsico (even though we are a Coke family).